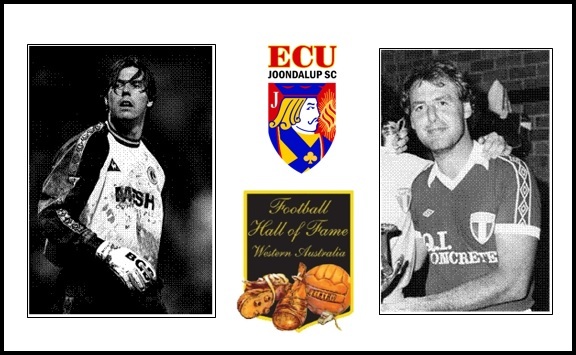 ECU Joondalup’s Technical Director of Football Andy Petterson and NPL Academy Coach Willie Kelly will both be inducted into the WA Football Hall of Fame on Saturday evening. The club are delighted for the pair and club spokesman Syd Amphlett said it’s a great honour for them both. “Willie McNally signed Andy in 2006 from the Newcastle Jets, and I was fortune to coach him as well the next season, before he became my assistant player/coach,” Syd Amphlett said. Born in East Fremantle, Petterson played for East Fremantle Tricolore first team aged just 16. He was in the WA State team at under 15’s to under 19’s and won an AIS scholarship in 1988. He was the first WA junior to gain a contract in England, after joining Luton Town in 1988. He was the first WA goalkeeper to play in the newly-formed English Premier League in 1993 with Ipswich Town. He also played 13 Premier League games with Charlton Athletic, where he won their Player of the Year in 1994. He played over 200 games in England before joined Australian NSL club Newcastle Jets in 2005, before returning to WA to play for ECU Joondalup. He was the General Manager of Perth Glory’s NPL and NYL sides and briefly a player with the Glory A-League side, before Joined the Jacks in 2006. A dynamic striker Kelly came to WA from Scotland in 1980, and was a key member of Perth Azzurri side that was unbeaten when winning the league in 1981. He also won the D-Orsogna Cup and Night Series with Perth, before he joined Spearwood Dalmatinac and won the league (unbeaten), cup and Top Four, and played six times for the WA State side. He then went into coaching and won the D’Orsogna Cup in 1992 with Stirling Macedonia, and took them to runners-up in the league twice. He then was assistant Coach at Western Knights with Ronnie Campbell, and helped them win the Premier League and Cup title twice. He joined ECU to coach in the clubs academy, and coached the under 12’s to the league and cup double last season and will coach the under 16’s NPL side in 2017.